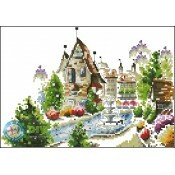 cross stitch chart only 319W*210H 88 color ..
cross stitch chart only 303W*220H 68 color ..
cross stitch chart only 303W*205H 52 color ..
cross stitch chart only 275W*219H 96 color ..
cross stitch chart only 308W*219H ..
cross stitch chart only 231W*236H .. Kit contains: 18 count Aida, stranded cotton threads, needle, chart & easy to follow instructio..
please select additional 14ct = 142*60cm .. Kit contains: 18 count ivory Aida, stranded cotton threads, needle, chart & easy to follow inst..